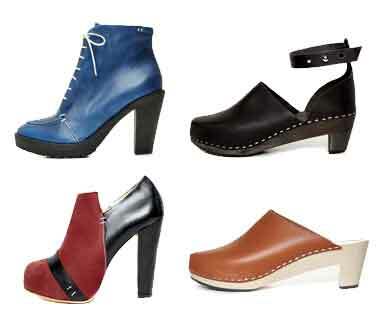 kiss4fashion: CLOGS and shoes, Fashion by Terhi Pölkki ! Terhi Pölkki's brand launched in fall 2011. Helsinki-based designer Terhi Pölkki’s style sums up the brand’s coveted aesthetic of minimalist luxury with a tough edge. This sustainable and high quality ecological vegetan leather shoe range is made in Portugal and Finland. The shoe collection is made of metal and chrome-free leather materials. The different surface structures combine matt and shiny materials. The end result is collection of layered uppers with hand-stitched details. Operating in a sustainable manner is an important principle for Terhi Pölkki’s brand: materials chosen for the shoes are ecological and of the highest quality; the leather used in the shoe collection is vegetable tanned, which means it does not contain any chrome or metals; and the tanning process of the leather also takes the environment into consideration by reducing water consumption, drying the leather at room temperature and re-using the solid waste as fertilisers. Terhi Pölkki shoes are made within a context that respect people and the environment. All of the shoes are manufactured within the European Union and the experienced factories in Portugal and Finland offer good work conditions for employees along with quality of craftsmanship.